If they are so worried about ‘fine particulates’ in the atmosphere, look no further than the military, which routinely sprays nano-particles of aluminum, strontium, and barium on the populace DAILY. This could account for the 2,000% rise in Alzheimer’s Disease among the people. This entry was posted in Keene, Local on November 1, 2018 by GSF. We wonder how many residents of Keene understand what form-based codes are and that their city is in the grips of these urbanists? These are the FEDS coming in to tell you how to run your city. This entry was posted in Federal, International, Keene, Local, Miscellaneous, State on March 14, 2018 by GSF. Meetings such as this one need to be attended heavily. For review: Remember, every plan is the same, they originate from HUD/Feds, and these entities who are unelected are lobbying for removal of your right to vote on them! This entry was posted in Keene on December 18, 2014 by Admin. Save Your Land Keene held an informational meeting on Saturday April 26th featuring Rep Jane Cormier and Ken Eyring, GSF researcher. Attached is a picture of a person who challenged the speakers. 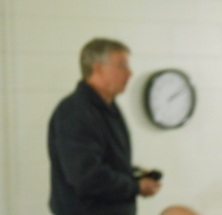 We are hoping someone can identify this person, who refused to give his name or sign into the event. The event-goers did note he had no facts to back up his assertion that Ken or Jane were wrong in their research on HUD contracts via Granite State Future RPC “central planning” schemes. This entry was posted in Keene, Local, Miscellaneous on April 29, 2014 by Admin.